GEBARA M.F. and Pereira, J. C. Perceiving the Amazon in the Anthropocene: reciprocities and conflicts between material and symbolic worlds. Article in progress to be submitted to International Political Sociology. GEBARA M.F. The natural ethics: Integrating affective ecologies and Amazonian indigenous ontologies in post-human politics. Chapter to be part of the book “Non-Human Nature in World Politics: Theory and Practice”, eds. Joana Castro Pereira and André Saramago, Springer. GEBARA M.F. Thinking beyond human-nature dichotomy: on the cosmopolitics of the Amazon. Chapter to be part of the book “Amazon’s Frontiers of Development”, eds. Antonio Ioris and Rafael Rossotto Ioris, Lexington Books. GEBARA M.F. 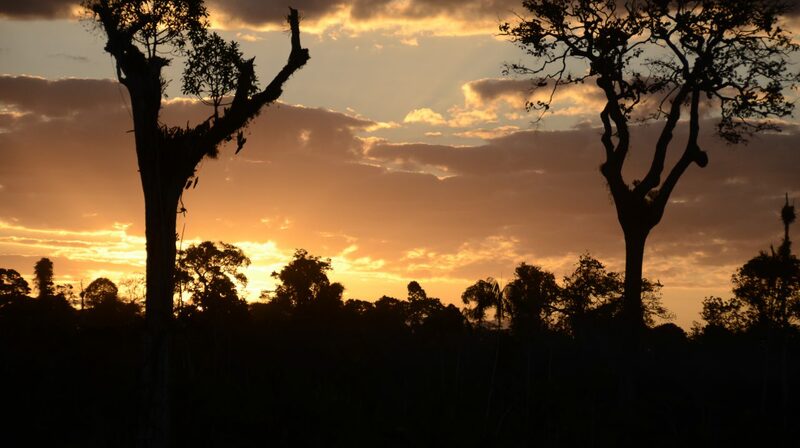 Understanding institutional bricolage: What drives behavior change towards reducing deforestation in the Eastern Amazon? Article under review at the International Journal of Commons. GEBARA M.F, Sills E., May P. and Forsyth T. Deconstructing the policyscape for reducing deforestation in the Eastern Amazon: Practical insights for a landscape approach. Environmental Policy and Governance 2019; 1– 13. LIMA G.; GEBARA M.F. ; MAY P. Forests and Brazilian Biodiversity. Economia do Meio Ambiente e da Energia, Fundamentos Teóricos e Aplicações. Eds. Santos T. and Santos L., Center for Integrated Studies on Environment and Climate Change – CentroClima/COPPE/UFRJ, Rio de Janeiro, LTC. KAISA KORHONEN-KURKI, MARIA BROCKHAUS, JENNIVER SEHRING, MONICA DI GREGORIO, SAMUEL ASSEMBE-MVONDO, ANDREA BABON, MELAKU BEKELE, VANESSA BENN, MARIA FERNANDA GEBARA, HERMANN W. KAMBIRE, FELICIEN KENGOUM, CYNTHIA MAHARANI, MARY MENTON, MOIRA MOELIONO, ROBERT OCHIENG, NAYA SHARMA PAUDEL, THUY THU PHAM, GUY PATRICE DKAMELA & ALMEIDA SITOE (2018): What drives policy change for REDD+? A qualitative comparative analysis of the interplay between institutional and policy arena factors, Climate Policy. GEBARA M.F. Tenure reforms in indigenous lands: decentralized forest management or illegalism? Current Opinion in Environmental Sustainability 32, 2018. GEBARA M.F. and AGRAWAL A. Beyond rewards and punishments in the Brazilian Amazon: Practical implications of the REDD+ discourse. Forests 8(3),66 2017. GEBARA M.F. ; MAY P.; CARMENTA R.; CALIXTO B; BROCKHAUS M.; DI GREGORIO M. Framing REDD+ in the Brazilian national media: how discourses evolved amid global negotiation uncertainties. Climatic Change p.1-14 2017. MAY P.H. ; GEBARA M.F. ; de BARCELLOS L.M. ; RIZEK M.B. ; MILIKAN B. The context of REDD+ in Brazil: Drivers, agents and institutions. CIFOR Occasional Paper no. 160. 112p. ed.3 2016. BROCKHAUS M.; KORHONEN-KURKI K.; SEHRING J; DI GREGORIO M.; ASSEMBE-MVONDO S.; BABON A.; BEKELE M.; GEBARA, M.F. ; KAMBIRE H.; KENGOUM F.; KWEKA D., BAHADUR KAHTRI D., MENTON M., MOELIONO M., SHARMA PAUDEL N., PHAM T. T., RESOSUDARMO I. A. P., SITOE A.; WUNDER S., AND ZIDA M. REDD+, transformational change and the promise of performance-based payments: A qualitative comparative analysis. Climate Policy 2016. BROCKHAUS M.; KORHONEN-KURKI K.; SEHRING J; DI GREGORIO M.; ASSEMBE-MVONDO S.; BABON A.; BEKELE M.; GEBARA, M.F. ; KAMBIRE H.; KENGOUM F.; KWEKA D., BAHADUR KAHTRI D., MENTON M., MOELIONO M., SHARMA PAUDEL N., PHAM T. T., RESOSUDARMO I. A. P., SITOE A.; WUNDER S., AND ZIDA M. Policy progress with REDD+ and the promise of performance-based payments: A qualitative comparative analysis of 13 countries. CIFOR Working Paper no. 196. Center for International Forestry Research (CIFOR), Bogor, Indonesia. LOFT L.; RAVIKUMAR A.; GEBARA M.F. ; PHAM T.T. ; RESOSUDARMO I.A.P. ; ASSEMBE S. GONZALES J.; MWANGI E.; ANDERSSON K. Taking Stock of Carbon Rights in REDD+ Candidate Countries: Concept Meets Reality. Forests 2015, 6(4), 1031-1060. KORHONEN-KURKI K.; BROCKHAUS M.; MAHARANI C.; DWISTARIO B.; BABON A.; BUSHLEY B.; GEBARA M. F.; KENGOUM F.; MOLIENO M.; PHAM T.T. ; RANTALA S. Coordination and cross-sectoral integration in REDD+: Experiences from seven countries. Climate Policy, 14(2), 167–186. GEBARA M.F. ; FATORELLI L.; MAY P.; ZHANG S. REDD+ policy networks in Brazil: constraints and opportunities for successful policy making. Ecology and Society, v. 19, p. 53, 2014. JAGGER P.; BROCKHAUS M.; DUCHELLE A.; GEBARA M.F. ; LAWLOR K.; RESOSUDARMO I.; SUNDERLIN W. Multi-Level Policy Dialogues, Processes, and Actions: Challenges and Opportunities for National REDD+ Safeguards Measurement, Reporting, and Verification (MRV). Forests, v. 5, p. 2136-2162, 2014. GEBARA M.F. Sustainable Landscapes Pilot Program in Sao Felix do Xingu, Brazil. In Sills, E. et al. (eds.) REDD+ on the ground. A case book of subnational initiatives across the globe. 1ed. : 2014. GEBARA M.F. ; MUCCILO L.; MAY P.; VITEL C.; LOFT L.; SANTOS A. Lessons from local environmental funds for REDD+ benefit sharing with indigenous people in Brazil, 2014. MAY P.; VIVAN J.; ANDRADE J.; GEBARA M.F. ; ARCO P. A Policymix: Conservation and Sustainable Use of Biodiversity with Poverty Reduction in the Amazon. International Policy Centre for Inclusive Growth United Nations Development Programme, 2014. DUCHELLE A.; GREENLEAF M.; Mello D.; GEBARA M.F. ; MELO T. Acre’s State System of Incentives for Environmental Services (SISA), Brazil. In Sills, E. et al. (eds.) REDD+ on the ground. A case book of subnational initiatives across the globe. REDD+ on the ground. 1ed. : 2014, v. , p. 33-. JAGGER P.; BROCKHAUS M.; DUCHELLE A.; GEBARA M.F. ; LAWLOR K.; RESOSUDARMO I.; SUNDERLIN W. D. The Evolution of REDD+ Social Safeguards in Brazil, Indonesia and Tanzania. 2014. GEBARA M. F. Importance of local participation in achieving equity in benefit-sharing mechanisms for REDD+: a case study from the Juma Sustainable Development Reserve. The International Journal of the Commons, v. 7, p. 301, 2013. DUCHELLE A. E.; CROMBERG M.; GEBARA M.F. ; GUERRA R.; MELO T.; LARSON A.; CRONKLETON P.; BÖRNER J.; SILLS E.; WUNDER S.; BAUCH S.; MAY P.; SELAYA G.; SUNDERLIN W. D. Linking Forest Tenure Reform, Environmental Compliance, and Incentives: Lessons from REDD+ Initiatives in the Brazilian Amazon. World Development, v. 45, p. 80, 2013. LUTTRELL C.; LOFT L.; GEBARA M.F. ; KWEKA D.; BROCKHAUS M.; ANGELSEN A.; SUNDERLIN W. D. Who Should Benefit from REDD+? Rationales and Realities. Ecology and Society, v. 18, p. art52, 2013. GEBARA M. F.; THUAULT A. GHG Mitigation in Brazil’s Land Use Sector – An Introduction to the Current National Policy Landscape 2013. MAY P.; GEBARA M.F. ; RODRIGUES G.; JORDAO C.; NOGUEIRA P. The effectiveness and fairness of the ICMS-E as a fiscal transfer for biodiversity conservation in Mato Grosso, Brazil. 2013. GEBARA M. F. (Ed./Org.). REDD+: Ministry of Environment Technical Report about financing, benefits and co-benefits, 1 ed. Ministério do Meio Ambiente. Brasília: MMA, 2012. 23 p. (e-book). GEBARA M. F.; MAY P.; SAMPAIO R.; THUAULT A. REDD+ Initiatives in Brazil: How Global Climate Accords are reflected on the ground? In: Jukka Similä and Eeva Primmer. (Org.). Legal analysis of the relationship between WTO law, European state aid and nature conservation law, and economic instruments for biodiversity protection. 1ed. : 2012, p. 25-41. SAMPAIO R. and GEBARA M. F. Expanding the role of forests and forestry practices in a post-2012 agreement. In: Mehling M.; Upston-Hooper K.; Merrill, A. (Org.). Improving the Clean Development Mechanism: Options and Challenges Post-2012. 1ed.Berlin: Lexxion, 2011, p. 125-138. MAY P.; ANDRADE J.; VIVAN J.; KAECHELE K.; GEBARA M. F.; ABAD R. Assessment of the role of economic and regulatory instruments in the conservation policymix for the Brazilian Amazon a coarse grain analysis. 1. ed. , 2012. v. 1. 88p. LUTTRELL C.; LOFT, L.; GEBARA M. F.; Kweka, D. Who should benefit and why? Discourses on REDD+ benefit sharing. Analyzing REDD+: Challenges and Choices. 1ed. : 2012, p. 129-152. JAGGER P.; LAWLOR K.; Brockhaus M.; GEBARA M. F.; SONWA D. J.; RESOSUDARMO I. A. P. A Multi-Scale Analysis of REDD+ Safeguards: Experiences from National REDD+ Policy Dialogues and Pilot Projects. In: Arild Angelsen, Maria Brockaus, William D. Sunderlin and Louis Verchot. (Org.). Analyzing REDD+: Challenges and Choices. 1ed. : 2012, p. 301-316. MAIA B.; SANTIAGO L.; GEBARA M. F. Empowering children and youth to deal with climate change: An exchange case between the states of Amazonas and Rio de Janeiro, Brazil. 2012. GEBARA M. F. REDD+ Institutions: A preliminary analysis. In: Romulo Sampaio e Carina de Oliveira. (Org.). A Economia Verde no Contexto do Desenvolvimento Sustentável. 2011. MAY P.; MILIKAN B.; GEBARA M. F. The context of REDD+ in Brazil: Drivers, agents and institutions. ed. 2, 2011. 69p. MAY P.; CALIXTO B.; GEBARA M. F. REDD+ politics in the media: A case study from Brazil. 2011. DUCHELLE A.; BORNER J.; WUNDER S.; ARAUJO E.; TEZZA J.; FARIAS R.; TONIOLO A.; GEBARA M. F. Grounding the REDD+ debate: Preliminary evidence from pilot initiatives in the Brazilian Amazon. 2010. GEBARA M. F. Mecanismo de Desenvolvimento Limpo: Ferramentas presentes no Mercado Internacional e o Desenvolvimento Sustentável 2005.